Freelancers, contractors, hired guns. Whatever you want to call them, independent workers are a growing part of the digital economy – particularly in marketing departments. Likewise, in today’s bustling times of too much work to do and limited budgets to hire permanent employees, women and men of action (i.e., those with specialized skills and relevant marketing experience) will always find work. Over 40% of the U.S. workforce will be freelancers, contractors, or temporary employees by 2020, according to Intuit. Harvard Business Review called out The Rise of the Supertemp in 2012. It’s safe to say that content marketing freelancers are here to stay. If you want to attract the good ones, you have to treat them right. When things work well, content marketing managers and freelancers can create beautiful work. When things don’t work well, it’s usually the content manager’s fault. 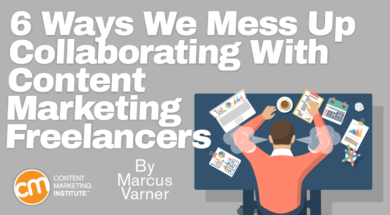 Here are six ways marketing managers screw up collaboration with freelance content creators and how to avoid them. See if this sounds familiar. A rush need for a piece of content comes up. You scramble to find a freelancer available for a tight turnaround. But each person in the freelancer pool already is juggling multiple projects for multiple clients. It takes a day or two to get someone to commit, which eats into the already tight deadline. Solution: Commit to a certain number of hours or projects per week or month with each freelancer. Keep a log of their work so you know who has time when you need someone to pitch in. Is this piece being published on an owned channel or another publication? If so, which one? Are there any length guidelines or other expectations by the publisher? Whose byline should be used? Will the article be based on an interview or the freelancer’s experience and research? Should this new piece follow the model of previous articles? Is there an angle around productivity to consider (e.g., individual vs. team productivity)? Or are there angles to avoid that have been overused? A good freelancer will ask questions like these. But if the writer doesn’t and you don’t volunteer the information, you could easily end up with a piece twice as long as you want that veers in an unwelcome direction, requiring a rewrite that wastes everyone’s time. Solution: Provide a creative brief or a similar depth of documentation at the start of every project. Just the act of filling out a series of standardized fields will help you see if you need to clarify with other stakeholders before getting a contractor involved. Even if you know your contractor is available and you’ve given thorough details about the job requirements, your project can still fail if you don’t allow adequate time for freelancers to do their best work. A same-day turnaround might work for email copy or a banner ad design but not for writing or designing a 32-page white paper. Solution: Keep your content calendar or project management tool up to date and share it with your freelancers. Make high-level assignments at the beginning of each month or quarter. Even if you don’t have all the details, your freelancers can be made aware and carve out the time. Fill in the requirements as you get the details. In this case, “wolves” mean “stakeholders.” I’ve seen situations where the project parameters were clear at the outset, but by the time the freelancer finishes the job, the project owners have changed their minds about the angle, look and feel, maybe even the topic itself – and the freelancer wasn’t informed. The stakeholders likely won’t remember when and how their expectations have shifted from the time the assignment was made (and they probably never saw the actual assignment since that’s the content marketing manager’s job). All they know is how they feel and what they want right now – and that the asset delivered by the freelancer doesn’t fit the bill. They may look at it as a failure on the part of the freelancer versus a failure of communication or process. Solution: Always act as the go-between, inserting yourself in the middle of conversations between stakeholders/reviewers and freelancers. Consider using digital-proofing software where everybody can log into a shared space and collaborate about comments and questions. Having an audit trail to refer to at any point along the way is a plus as well. By the time someone remembers to notify the contractor, it consists of an awkward, “Oh, did we forget to tell you? This project has been cancelled,” email. And by then, the department is stuck paying the freelancer for the work done even if it’s never used. Communicating feedback to freelancers also is important. Accepting their work with a “thanks” isn’t going to help them improve and evolve to better meet your expectations. Solution: Bring freelancers into your work process so they see and can react to the same communication you’re seeing. Let them fix their own work based on your feedback so eventually you’ll have little to fix. Training is just for employees, right? Wrong. A thorough orientation that includes relevant guidelines and materials may be even more important for freelancers because they won’t be in the office gaining organic exposure to the brand day in and day out. I once worked six months before discovering that my client had established voice and messaging guidelines. I had modeled my work after their published work so I picked up many of the guidelines intuitively, but seeing them typed out clearly made a big difference in my ability to meet and exceed their expectations. Each side has responsibilities in the freelancer-content marketing manager relationship. Contractors should proactively ask for answers, brand guidelines, creative briefs, and more if they’re not offered. Managers need to be mindful about keeping freelancers trained and well-equipped with the tools, access, and information they need to succeed. After all, most hired guns aren’t looking only for the organization that will pay the most. They want to care about the work they’re doing; they want to be trusted; they want adequate turnaround times; they want their work to be valued; and they want clients who are organized and easy to work with. These are the same things we’re all looking for in a workplace. Editor’s note: We appreciate Workfront’s support of Content Marketing Institute as a paid benefactor. This article was reviewed and edited independently to ensure that it adheres to the same editorial guidelines as all non-sponsored blog posts. Stay informed about all aspects of the content marketing process. Sign up for the free daily newsletter with tips, trends, and insights to improve your content marketing program. Over the last 9 years, Marcus has worked in every type of content—from writing to video production to design—and is currently a Senior Content Marketing Manager at Workfront. His focus is always on breaking through the clutter while engaging audiences with brands' most foundational messaging. He currently oversees all corporate- and awareness-level level content at Workfront. Follow him on Twitter @MarcusWorkfront.